It’s that time again… It is time for another meal delivery service battle! In today’s comparison we’re comparing one of the titans of the meal prep delivery world, HelloFresh versus a rapidly growing challenger, Sun Basket. 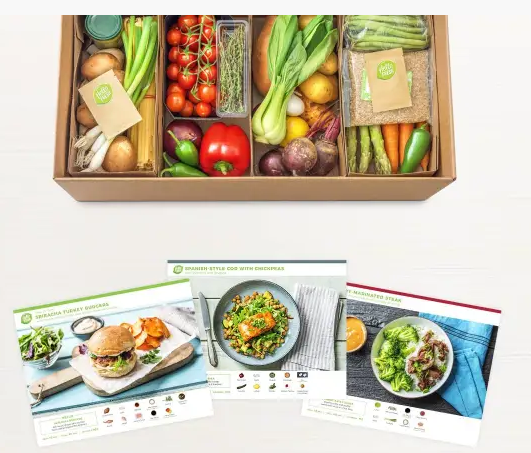 HelloFresh is one of the most popular and one of the best meal delivery service in the United States, and with such a large marketing budget, you can hardly watch TV, listen to a radio, or browse the internet without seeing one of their ads. Sun Basket is one of the only certified organic meal prep services, that is aimed at providing organic and high quality ingrediets that meets the needs of their health conscious customers. Click these links to read a more in depth review for Sun Basket Meals and Hello Fresh Delivery. 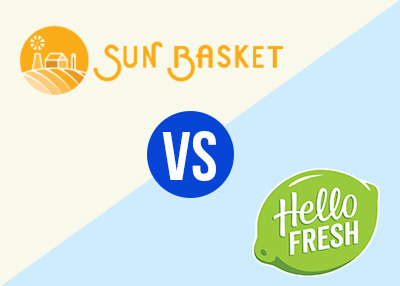 Sun Basket or HelloFresh Dinner Delivered - Which One To Choose? By contrast, Hello Fresh offers 3 different healthy food plans – the Family Plan offering 2-3 dishes a week for 4 individuals, The Classic meal delivery Plan offering 3 to 4 dishes a week for 2 or 4 individuals, and the Veggie Plan – which is perfect for 2 or 4 individuals with 3 recipes a week. An impressive selection of 24 different dishes a week is offered by Sun Basket between the two healthy meal delivery services plans they offer. Their Classic Plan offers 18 dishes to choose from, and their Family Plan offers 6 dishes. With both of these meal prep delivery services plans, there is an option for choosing a menu catering to what your dietary requirements are, like vegetarian, vegan, lean and clean, gluten-free, paleo, and more. The additional variety for individuals with dietary needs, provides unique and wonderful diversity to those special diet food services that Sun Basket offers. Hello Fresh offers 16 recipes in total per week among their three best food delivery plans. Their Classic Plan offers 8 recipes, their Family Plan offers 5, and their Veggie Plan offers 3. To clarify, that means if you choose the Veggie Plan you don’t have the flexibility of selecting all their dishes. You are not able to mix dishes from the 3 different plans during the same week. However, from one week to the next you are able to switch your prepared meal delivery service plans. I have been able to enjoy tasting meal kits from both Hello Fresh and Sun Basket for a long time and can confidently say that every meal that I have tasted was absolutely delicious! In my opinion, Sun Basket is much more focused on innovative and healthy new age cooking. They offer plenty of healthy alternatives like whole rice, gluten-free organic ingredients, and greens. Hello Fresh, by contracts, attempts to focus on more well-known and traditional cooking. Their recipes have a tendency to be very classic, without a lot of unusual flavors and sophisticated cooking techniques. That can be a great option as their recipes require less sophisticated cooking techniques. That can be a great option and less intimidating for individuals who are not very confident with their cooking skills. Both Hello Fresh and Sun Basket offer very high-quality ingredients overall. Sun Basket makes a unique promise that all of the ingredients that they send you are sustainably sourced and organic. That is a unique promise within the industry and helps to differentiate the company from all of the market’s home food delivery services. Meats provided by Hello Fresh are mainly sourced domestically. They promise that all of their poultry is both hormone and antibiotic free. All of their seafood is sourced sustainably, and their pork is all certified that it is hormone free. It is very important to note that not all vegetables offered by Hello Fresh are always organic, but instead, are attempting to help customers take the steps that are necessary to get more vegetables and fruits incorporated into their lives. Both complete meals delivered companies use boxes that come labeled with their company logo and are practical and aesthetically pleasing. In terms of delivery, the contents provided by both companies that are labeled, organized, separated and bagged individually. It is always a pleasure to get these deliveries and a great way to save time knowing you won’t have to sort anything. Both meals delivered to your door companies also have their cooled proteins placed on the bottoms of their boxes with the right amount of ice. That means the box can stay out of the refrigerator for a couple of hours without it being a concern. These days customers care a lot about how their purchases impact the environment and their carbon imprint. This has been noticed by meal delivery companies and that is particularly true for Sun Basket and Hello Fresh. Your meals from Hello Fresh come in boxes that are fully recycled made out of virgin fiber and cardboard, and it can all be recycled after you are done with our cooking. The company also ensures that it uses a number of local producers to support those doing the work in a way that is sustainable. 100% recyclable packaging is also used by Sun Basket and the push by the company to use 100% organic produce really says a lot out the company’s priority that it places on the environmental impact. Low-impact farming and fishing are supported by Sun Basket in addition to sustainable crop rotation. The dinner delivery service companies both offer an easy to use and well-organized app and website. You can register, add in your eating preferences, choose and change your desired dishes and plan, change the payment method, etc. – and do all of this in a straightforward and easy way online. You also can see future and past menus, which includes the actual recipes along with information about the dishes. Both companies offer a subscription service, along with the option of easily skip weeks if necessary. Also, they both offer flexibility in choosing the day that you prefer your delivery to be. If you want to cancel your account, with Hello Fresh you can do this online. You have to contact customer support with Sun Basket, but they do reply quickly and will immediately cancel your account. One signature sauce is offered by Sun Basket per week for $4.99. There are two add ons that are offered Hello Fresh – with the first one being a useful selection of kitchenware – storage solutions, knives, cooking ware, prep tools, etc. A monthly wine subscription is their second selection, that costs $89 with a 6 wine bottle selection per month. You are able to choose between a mixed wine, white, or red plan. You pay $11.00 per saving on Sun Basket’s classic menu and their family menu is $10.99 per serving. When you order additional servings per week the price per serving does not go down, and the shipping charge is always $6.99 per order. The per serving price with Hello Fresh is a little lower. On the classic and veggie plans, the cost is $9.99 per serving and the family plan costs $8.74 per serving. The main difference here is the shipping usually is free with Hello Fresh. Sun basket will be the best option if you prefer to eat organic produce as part of your diet, also if you have specific dietary requirements like Gluten Free, Paleo or Diabetic, since their recipes are dietician approved. If none of the above apply to you, then HelloFresh could be a good option as their meal kits are cheaper, they offer free shipping. Sun Basket is our winner – their genuine commitment for delivering sustainably sourced and organic ingredients, and their diversity and variety of weekly recipes are incredible!